Digital transformation has almost touched every aspects of business, especially in the domain of digital marketing. Businesses are becoming increasingly aware of the fact that millions of people spend a major part of their time poking around digital platforms and the most efficient way to reach them is by creating robust and data-driven digital marketing strategies. Digital marketing has become a dynamic segment; globally, a lot of companies are coming forward initiating a radical shift in the field by combining creativity, technology and analytics. Instituting this transformation in India, Digato, a digital marketing consultancy and advertising agency, offers a sturdy digital presence for brands, start-ups and enterprises through their compelling digital strategies. This Gurgaon based firm is redefining the digital marketing field with its cost-effective and measurable services and assured returns. “In Indian market, many of our businesses are still ten years behind when it comes to the digital transformation. And above all, several marketing agencies are not able to deliver desired results to customers. Majority of the customers who come to us have already burnt their hands in working with external marketing companies. Followed by a thorough market research, Digato guarantees customers a certain kind of revenue push and we’re proud to say that Digato has been able to achieve 8x ROI for clients in 22 days,” states Aakash Malhotra, Founder and Managing Partner, Digato. Within the first six months of inception, Digato has grown to exponential heights generating 8 figure revenues. Compared to last year, the company achieved five times bigger revenue this year. With branches in Delhi and Mumbai, followed with expansion plans to Bengaluru, Digato has served various clients like Teach for India - NGO, Nappa Dori - life style store, The Grub Fest - India's biggest food festival, Dirtsmash and Uncube – Revolutionising the work space on India. 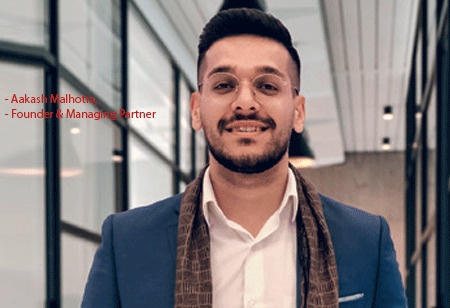 Talking about their success, Aakash Malhotra, who is also an Social Media Influencer with 100k+ followers and a globetrotter, visited 36+ countries, says, “We strive for excellence but not at the cost of our team's happiness. As a 21st century company, we have implemented creative and motivating work culture, which is rooted in ‘work from wherever’ concept. At Digato, we don’t count working hours; instead, we look out for results. With such work culture, we are able to pull those numbers, conduct successful projects, manage a team high on energy and motivated to take on challenges. We also believe in the power of independent professionals, a.k.a freelancers and believe they match the vibe we are trying to set in our company's culture.” Growing fast, team Digato that consist 10 full-time professionals and 17 freelancers is all set to expand into Singapore. Meanwhile, they are also planning for moving towards 100 percent consulting business model, focused on ROI/Revenue marketing.